Laura J. Bontempo, MD, MEd, is a co-editor of the February issue of Emergency Medicine Clinics of North America, along with Jan Shoenberger, MD, from the Keck School of Medicine of the University of Southern California. The topic of the issue is ear, nose, and throat emergencies. She and Sara Manning, MD, co-authored the article titled “Tracheostomy Emergencies.” Amal Mattu, MD, continues as the consulting editor for this journal and, in that capacity, wrote the foreword for this issue. Kyle R. Fischer, MD, MPH, Director of UMMC's Public Policy Fellowship, is the lead author of the review article titled “Trauma-Informed Care for Violently Injured Patients in the Emergency Department,” which has been accepted for publication by Annals of Emergency Medicine. Dr. Fischer and his co-authors from the University of Colorado, Drexel University, the University of Pennsylvania, Einstein Medical Center, Boston University, and the Medical College of Wisconsin are members of the National Network of Hospital-Based Violence Intervention Programs. Zachary Dezman, MD, MS, MS, was contacted by the Associated Press to comment on Second Chance, an app developed at the University of Washington and now being tested for its ability to detect the shallow breathing that suggests opioid overdose. Installed on a smartphone, the software uses the microphone and speaker to send out inaudible sound waves and then record how they bounce back. Analysis of the signals indicates the slowing or cessation of breathing. In its current stage of development, the app requires a bystander to interpret the alarm and summon help for an opioid user in trouble. The developers are working on technology that would call for help independently when signs of overdose are detected. The app and its preliminary test results are described in the January issue of Science Translational Medicine. 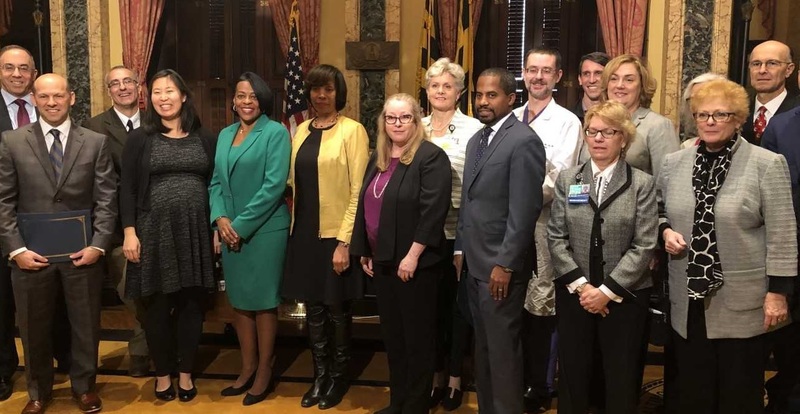 At a press conference held at Baltimore’s City Hall on December 19, Mayor Catherine Pugh announced that the University of Maryland Medical Center’s midtown and downtown campuses have been awarded “Level 1” status, the highest certification in the city’s efforts toward addressing the opioid epidemic. The city’s Levels of Care initiative assesses hospitals’ ability to provide treatment to patients who screen positive for a substance use disorder, distribute naloxone to patients, and ensure physicians are prescribing opioids judiciously. Of the 11 hospitals assessed, UMMC and Midtown were the only two in the top tier of readiness and resources to offer comprehensive and timely treatment to ED patients struggling with opioid addiction." UMMC’s Opioid Task Force is co-chaired by Christopher Welsh, MD, and R. Gentry Wilkerson, MD. Attendees at the Wednesday morning press conference included Reginald Brown, MD, ED Director, Bon Secours; Michael Jablonover, MD, MBA, CMO and Senior Vice President of UMMC; Mary Beth Haller, interim Baltimore Health Commissioner; and Alison Brown, MPH, President of UMMC’s Midtown Campus.